Children’s Books in Children’s Hands: A Brief Introduction to Their Literature familiarizes current and future teachers with the best and most recent books for children. The renowned author team presents richly illustrated, practical ideas for sharing literature with children as a source of enjoyment and inspiration that will last them all their lives. This authoritative, captivating, and popular guide establishes a roadmap for understanding the world of children’s literature, including its writers, illustrators, editors, and critics, while also providing a strong emphasis on books from many cultural groups. The 6th Edition now includes full color illustrations and art, newer title annotations, new teaching ideas, coverage of shifting changes in genres, and thorough coverage of multicultural and international books. Charles Temple is a guitar and banjo-picking storyteller, poet, and sometime children’s author who teaches courses in children’s literature, storytelling, writing for children, literacy, and international education at Hobart and William Smith Colleges in Geneva, New York. He has written many books in the fields of literacy and children’s literature. Internationally, he serves as an advisor to projects in Tajikistan, Liberia, and Sierra Leone helping authors and illustrators produce books for children, and helping teachers teach with them, with the support from CODE of Canada, USAID, and the World Bank. He co-chairs the International Literacy Association’s Special Interest Group on Literacy in Developing Countries, and serves on the board of Storytellers in Higher Education, an affiliate of the National Storytelling Network. 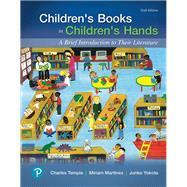 Miriam Martinez teaches children’s literature and literacy courses at the University of Texas at San Antonio. She is actively involved in the Children’s Literature Assembly, the National Council of Teachers of English, the International Literacy Association, and the Literacy Research Association. Her research and publications have focused on the nature of children’s literary meaning-making, children’s responses to literature, and their understanding of various literary genres and formats. She also conducts content analyses of children’s books. Junko Yokota is Director of the Center for Teaching through Children’s Books and is Professor Emeritus at National Louis University in Chicago. She held research fellowships at the International Youth Library, the Staatsbibliothek in Berlin, and a Fulbright at the University of WrocBaw in Poland. She served on the Caldecott, Newbery, Batchelder, Pura Belpré, and Ezra Jack Keats Committees; and Bologna, Nami, and Hans Christian Andersen Juries. Her research focuses on picturebooks, multicultural and international literature.